Even though the 2013 iteration of the Texas State Fair came to an end on October 20th, we here at Pickem Dash Football didn't want to miss the chance to review our favorite new food booths. Most of you kept with the grand tradition of state fairs and deep fried foods. BOOTH #22 - The Northmen (ANo): Deep Fried Macaroons. BOOTH #A6 - Mrs. Carter's Moves (A-C): Fried pork dumpling ... on a stick. BOOTH #69 - Chicainery (CCa): Chicken fried Erin Andrews ... you're welcome Goon! BOOTH #46 - 15 National Championships (CG): Deep Fried Maker's Mark. So there is this scrapple brick thing with eggs stuffed in it and then fried. Who wouldn't give that a try? For those of you who don't know what they are ordering here, Wikipedia describes Scrapple, also known by the Pennsylvania Dutch name pon haus, as traditionally a mush of pork scraps and trimmings combined with cornmeal and wheat flour, often buckwheat flour, and spices. +4 Of course I'm down. BOOTH #39 - Pimp Possee (JB): Crawfish stuffed Twinkies chicken fried on a stick. BOOTH #2 - The Velvet Neutral Ground (JC): Deep Fried Cow Patties. BOOTH #4 - Naked Bootleggers (JN): Fried Beer on a Stick. BOOTH 8.5% - Barrel Aged Donkey (KS): Fried bourbon barrel aged stout. 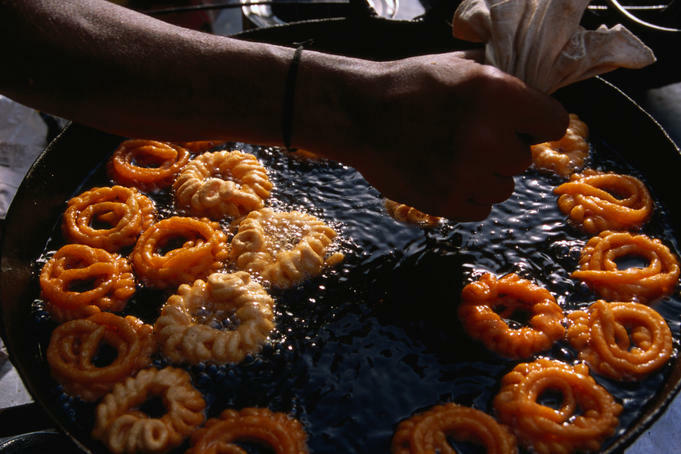 BOOTH TRI - The Creekside Purple Sacks (KH): Fried Jalebi. BOOTH #28 - AccidentChild (MN): Fried cake, covered in gravy. BOOTH LOS DOS - One Man Wolfpack (MF): Deep fried, T-bone steak breakfast taco, then deep fried again. BOOTH #750 - Mad Bomber (KZ): Fried fireball whiskey. BOOTH #13 - Gig'em! (AP): Deep fried Bevo. 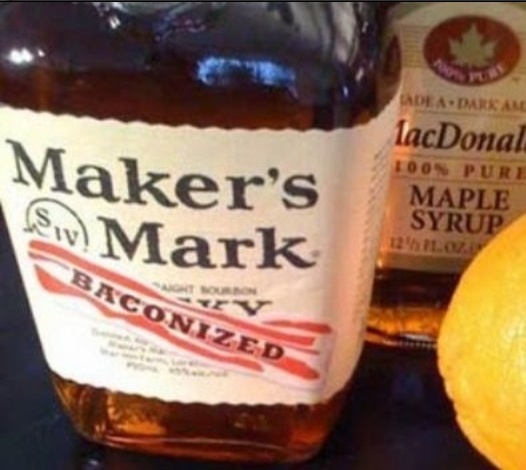 Some people know that bacon makes things better. BOOTH #911 - Inconsistent Losers (ANe): Bacon-wrapped Chocolate-dipped Funnel cake. BOOTH #8 - Dirt Burglars (DT): Pretzel stuffed with bacon, wrapped in bacon, dipped in chocolate, drizzled in white chocolate, smothered in whip cream, with hot fudge and sprinkles. At a state fair, healthy is relative. Here are some items that aren't fried or wrapped in bacon. BOOTH #2009 - Beelzebubbles (CCo): Frozen Menudo on a stick. With Hominy. Salty Limon on the side to garnish for taste. I wanted to like this, but you have to like cold soup to enjoy frozen menudo. Or savory popsicles. +5 for originality. BOOTH OO - Mississippi Mudpuppies (DR): Blonde with a great big pair of ... dark brown eyes. Holding a slice of pie. BOOTH #* - Ferments-A-Lot (GN): Longhorn meat and longhorn cheddar cheese kolaches with free dirt cake samples. BOOTH #21 - Yazoo Meat Muffins (KP): 21 ounce t- bone steak marinated with Texas style spice rub...medium to rare of course. 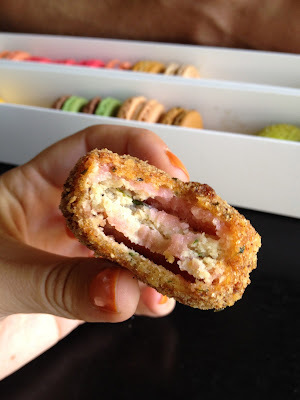 BOOTH #1 - Double D (DD): Deep fried has been all the rage for a few years but after a while everything looks and tastes about the same after being dunked in a vat of boiling pig fat and flash fried. In the spirit of Texas we're going to build a miniature electric chair and strap a live chicken wearing sooner shirt and every time the sooners score or the longhorns fumble we're going to give a jolt. At the end of the game we're going to roll it in powdered sugar and beer and call it Chair Fried Brown Mack Chicken. Good job. Good effort. Good picking.